How about too much FRUIT? I mean, fruit is a great thing – right? But who remembers the “grapefruit diet” trend that went on years ago. Eat a grapefruit for every meal… Seriously? Who thought this would be a good idea. Yuck! It should have been called “How to get sick of grapefruits super fast so that you never wish to eat one again!” I can even make a grapefruit face. Lips together – and PUCKER. If you can’t do something, and do it for the rest of your life – then WHY BOTHER? So whatever the trend is today… ask yourself – IS THAT going to help me keep my weight at a healthy level for life? Am I willing to do that forever? I know Fat-Free dieting didn’t work, neither did that carb free diet (hello, your body NEEDS carbs, just the good ones! Not to mention it made you a grouch! ), the Sugar busters diet didn’t work either because again… lots of good foods have sugars… so know how much is ok! How about drinking your meals everyday? Is that a lifestyle? How about the hormone diets… how are those working long-term – and are the long-term effects of some of these fads? Sure there are lots of crazy ways out there to lose weight, control your weight, satisfy your hunger, cleanse your body of toxins… but when it comes down to it – you HAVE TO LEARN what your body needs, and how to feed it properly, and exercise. If you do not learn those things – sadly you will be on a yo-yo of gaining and losing weight for the rest of your life. Maybe that “last five pounds” isn’t moving because you body needs it? If you like short-term successes only – then by all means… knock yourself out. But you’ll also burn yourself out really quickly. Here is a little chart from the USDA Nutrient Database that my friend Jillisa shared with me (Thanks Jillisa!). 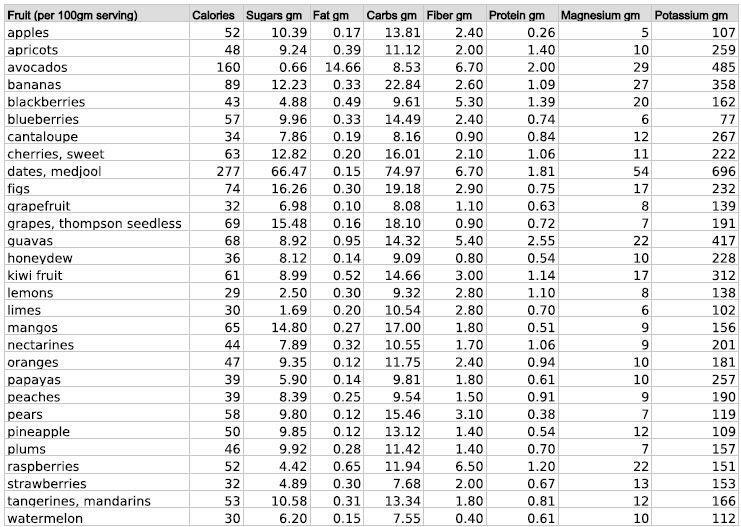 It shows some info about the nutrition information on fruits. Look through here and see if there are any surprises for you. Keep in mind a normal serving is probably smaller than a 100 gm serving. A serving of fruit fits in a cupped hand. So now tell me – can you get too much of a good thing? We have to keep paying attention to what we’re putting in. Lots of people push avocados – I’ve seen beautiful ads and commercials for them – and they do have lots of great things in them… but, like nuts – they also have a lot of FATS and calories too. Bananas are an awesome source of potassium, but can also rack up the sugars in a hurry. We live in the information age, and we have the information we need to make the best choices for our bodies. Don’t waste it! Use it to continue being healthy for HIM! Posted on February 6, 2012, in Truth. Bookmark the permalink. Leave a comment.